Note: The author of this paper is not an M.D. The contents of this paper are based on the listed references and are offered for educational and informational purposes only. This article is meant to bring attention to a timely treatment therapy that should be considered; it is not meant to be a complete literature review for either agent. Patients should refer to their health care provider for medical advice. Note from Al Musella, DPM 3/2/2008: Recent evidence points to the use of Avastin alone may be as good as the combinations. Other drugs besides cpt-11 are being tried with good results. Trials are ongoing - but I just wanted to make you aware that there are now more options. In October, 1998, CPT-11 (Irinotecan) received full FDA approval for metastatic colon cancer that had recurred or spread following treatment with standard chemotherapy. CPT-11 inhibits topoisomerase I, an enzyme that relaxes supercoiled DNA during replication and transcription. Binding of CPT-11 to this enzyme stabilizes topoisomerase I and DNA. When advancing replication enzymes collide with the drug-topoisomerase I-DNA complex, double stranded DNA breaks occur that result in tumor cell death. In the late 90’s, CPT-11 showed promising results in preliminary pre-clinical and clinical trials for brain tumor treatment (1). Ensuing clinical trials with CPT-11 showed activity for adult patients with recurrent malignant glioma (2); pediatric patients with high risk malignant brain tumors (3, 4); and in combination with BCNU (5, 6), and Temozolomide (7, 8, 9, 10). Avastin (bevacizumab) is a therapeutic, recombinant, humanized antibody designed to specifically inhibit vascular endothelial growth factor or VEGF, a protein that plays a major role in angiogenesis and the maintenance of existing blood vessels throughout the life cycle of a tumor. By inhibiting VEGF, Avastin is designed to interfere with the blood supply to a tumor, which is thought to be critical to a tumor's ability to grow and spread in the body. In 2002, phase 3 clinical trials were undertaken against several cancer types to establish the efficacy of Avastin (11). Avastin was approved by the FDA in February 2004, as a first line treatment for metastatic colorectal cancer and was further approved in October 2006, in combination with carboplatin and paclitaxel for the first-line treatment of patients with unresectable, locally advanced, recurrent or metastatic, non-squamous, non-small cell lung cancer (12, 13). Such was the potential of Avastin and the anti-VEGF concept that it was readily tried against numerous more challenging cancers. Below are the scans of a 75 year old woman with a GBM. 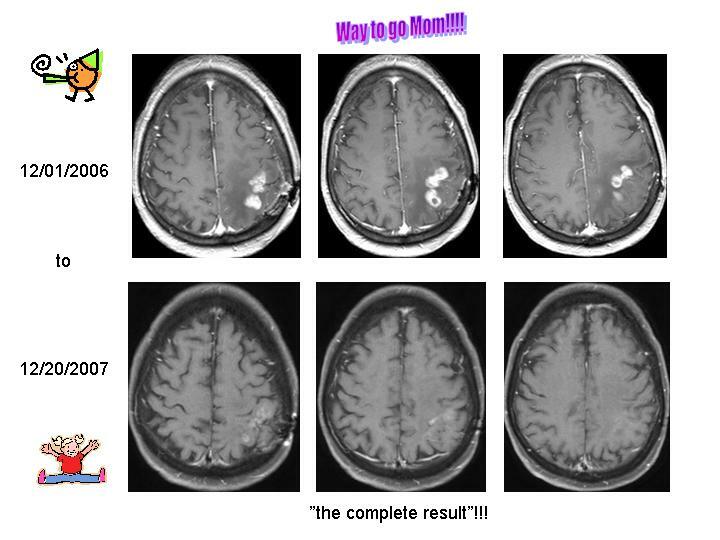 The first scan was taken prior to beginning Avistan/CPT-11 and the remaining scans show the progress over a 12 month period. (She generously released these for informational purposes.) Of course these results are not representational of all individuals treated with Avistan/CPT-11 but do indicate one individual with a very positive outcome. Special acknowledgement is made to the Health Clinic Students of the Albany Law School for their efforts in winning an insurance appeal for Avastin/CPT-11 combination therapy. Their research was very useful in developing this review. For more information on fighting insurance denials for Avastin/CPT-11 see http://www.albanylaw.edu/sub.php?navigation_id=1454 and contact the Musella Foundation. 1. Jory V, CPT-11 for Brain Tumors, Clinical Trial and Noteworthy Treatments for Brain Tumors, Musella Foundation, May, 1999. http://www.virtualtrials.com/cpt11.cfm. 2. Friedman HS, Petros WP, Friedman AH, et al., “Irinotecan therapy in adults with recurrent of progressive malignant glioma.” J Clin Oncol. 1999 May;17(5):1516-25. 3. Blaney S, Berg SL, Pratt C, et al., “A phase I study of irinotecan in pediatric patients: a pediatric oncology group study.” Clin Cancer Res. 2001 Jan;7(1):32-7. 4. Turner CD, Gururangan S, Eastwood J, et al., Phase II study of irinotecan (CPT-11) in children with high risk malignant brain tumors; the Duke experience.” Neuro Oncol. 2002 Apr:4(2):102-8. 5. Reardon DA, Friedman HS, Powell JB Jr, et al., “Irinotecan: promising activity in the treatment of malignant glioma.” Oncology. 2003 May;17(5 Suppl):9-14. 6. Quinn JA, Reardon DA, Friedman AH, et al., “Phase I trial of irinotecan plus BCNU in patients with progressive or recurrent malignant glioma.” Neuro Oncology. 2004 Apr;6(2):145-53. 7. Jones SF, Gian VG, Greco FA, et al., “Phase I. Trial of irinotecan and temozolomide in patients with solid tumors.” Oncology. 2003 May;17(5 Suppl):41-5. 8. Gruber ML and Buster WP, “Temozolomide in combination with irinotecan for treatment of recurrent malignant glioma.” Am J Clin Oncol. 2004 Feb;27(1):33-8. 9. Reardon DA, Quinn JA, Rich JN, et al., “Phase I trial of irinotecan plus temozolomide in adults with recurrent glioma.” Cancer. 2005 Oct 1;104(7):1478-86. 10. Fountzilas G, Karkavelas G, Kalogera-Fountzila A, et al., “Post-operative combined radiation and chemotherapy with temolozomide and irinotecan in patients with high-grade astrocytic tumors. A phase II study with biomarker evaluation.” Anticancer Res. 2006 Nov-Dec:26(6c):4675-86. 11. Jain RK, “Tumor angiogenesis and accessibility: role of vascular endothelial growth factor.” Semin Oncol. 2002 Dec;29(6Suppl 16):309. 13. Hurwitz H, Fehrenbacher L, Novotny W, et al., “Bevacizumab plus Irinotecan, Fluorouracil, and Leucovorin for Metastatic Colorectal Cancer.” N Eng J Med. 2004;350:2335-42. Available at http://www.ncbi.nlm.nih.gov/sites/entrez?cmd=Retrieve&db=pubmde&dopt=AbstractPlus&list_uids=15175435 . 14. Vance VS. “Bevacizumab (Avistan) and CPT-11 (Camptosar) in the Treatment of Relapsed Malignant Glioma.” Abstract from the World Federation of Neuro-Oncology Second Quadrennial Meeting and Sixth Meeting for the European Association for Neuro-Oncology, May 5-8, 2005, Abstract 342. 15. Pope WB, Lai A, Nghiemphu P, et al., “MRI in patients with high-grade gliomas treated with bevacizumab and chemotherapy.” Neurology. 2006;66:1258-1260. 16. Vrendenburgh JJ, Desjardins A, Herndon JE 2nd, et al., “Bevacizumab plus irinotecan in recurrent glioblastoma multiforme.” J Clin Oncology. 2007 Oct 20;25(30):4722-9. 17. Gonzalez J, Kumar A, Conrad C, and Levin A, “Effect of bevacizumab on radiation necrosis of the brain.” Int J Radiat Oncol Biol Phys. 2007 67(2):323-26. 18. Raval S, Hwang S, and Dorsett L, “Bevacizumab and irinotecan in patients with recurrent glioblastoma multiforme.” J Clin Oncol. 2007 25(18S):2078. 19. Friedland D, Ali S, Ahmad A, et al., “Bevacizumab plus irinotecan therapy in relapsed, heavily pre-treated malignant glioma: a case series.” J Clin Oncol. 2007 25(18S):12500. 20. Kang T, Jin T, Elinzano H, and Peereboom D, “Irinotecan and bevacizumab in progressive primary brain tumors: The Cleveland Clinic experience.” Am Soc Clin Oncol 43rd Annual Meeting, 2007. Abstract 2077. 21. Omuro A, and Delattre J. “What is new in the treatment of gliomas?” Curr Opin Neurol. 2007;20(6):704-7. 22. Friedman HS. “State-of-the-art Therapy for Glioblastoma Multiforme.” US Oncol Dis 2007 Issue 1, May.